Whether you are looking for a fun birthday party for the kids, a barbecue supper out for your tour or organization, or a place for an elegant wedding, the Lazy T Ranch has a place for you! We host all types of activities and events for all ages. A short list of some activities is below, but we can accommodate any activity - just give us a call! For a perfect conference tour, family reunion, or club meeting, nothing beats a fantastic home-cooked supper with all the trimmings at the Lazy T Ranch in Manhattan, Kansas. Beef is our specialty! As beef cattle producers ourselves, we know the importance of high quality, well-prepared beef. We can prepare roast beef, steaks, hamburgers, hot dogs, chicken breasts, and even vegetarian options for lunch or dinner. Ideal for young cowboys, cowgirls, family, and friends to celebrate birthdays and other special events! 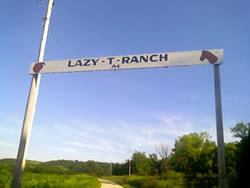 The Lazy T Ranch now offers the Pony Party Place. 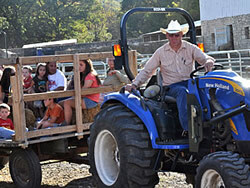 School classes, day cares, home school groups, and families are welcome to visit the ranch by appointment. 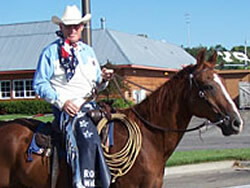 Rancher Ron will greet the group and share the history of the cowboy and the Lazy T Ranch. The Lazy T is the area's only laser tag facility. 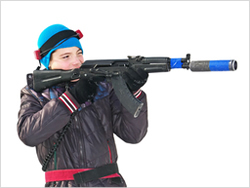 Enjoy this unique sport as you team up with other players for fun-filled games. If you are seeking a beautiful Flint Hills location for your wedding and/or reception, the Lazy T has several vistas, native prairie meadows, and event venues for your consideration. Wedding packages are available. New at the Lazy T are a herd of farm animal friends for children to choose, stuff, dress and take home! 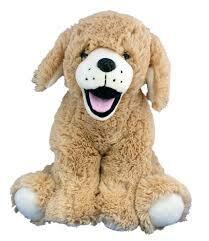 Coming will be stories about those animals, so that children can learn more about them and caring for animals.